CMLLE comes alive with a heart full of love emanating from the Heart of Jesus and the Blessed Mother. As we journey in faith with Jesus, Mary, St. Joseph and St. Francis towards our Heavenly Father in Heaven, we join hands with our fellow pilgrims offering our daily prayers, Marian devotions, Masses, Eucharistic Adoration, Liturgy of the Hours, rosaries, and receptions of the Sacrament praising God everyday of our lives. All these we do and share with each other as our response to the universal call to Holiness and to "Proclaim the Kingdom of God on earth!" At Baptism, we are all tasked to "go into the world and proclaim the Kingdom with our being, our actions, and in the way we live. St. Francis echoed the same: "we preach with our lives. We use words if necessary." We start with our "being" and then we go to our "doing." As we receive the blessings of God, our cup overflows to our family, friends, relationships, community and the world! Even just one "Hail Mary" a day, we are connecting with the Blessed Mother's love to her Son, Jesus. How much more when we do a rosary and the other Marian devotions? Each day, let us renew and re-affirm our love for Christ through Mary, our Blessed Mother! In the prayer: MEMORARE - it says "never was it known that anyone who fled to thy protection, implore thy help, or sought thy intercession was left un-aided." I firmly believe in the strength and power of this intercession...when we approach God through Mary, especially with a contrite and humble heart. Deep in my heart, I know every one can do it, how about you? P.S. . . Please revisit this website now and then!. . 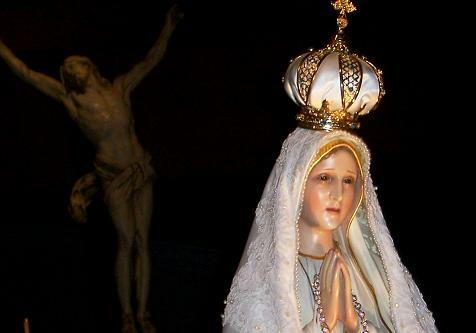 Our Lady, we crown you with our "Hail Mary's" each day!